After the holidays, I was back in the shop working to reed the columns for the Egerton tall clock. You all know that I’m more power based when I woodwork, so I first turned to my router and router table to form the reeds. 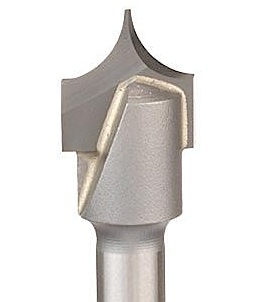 I had a small router bit with a needle point (similar to the one shown below at right). I built a small carrier for the columns, installed the bit in my router table, adjusted the fence to cut at the center of each column then raised the bit ever-so-slightly until the two radii were just formed. 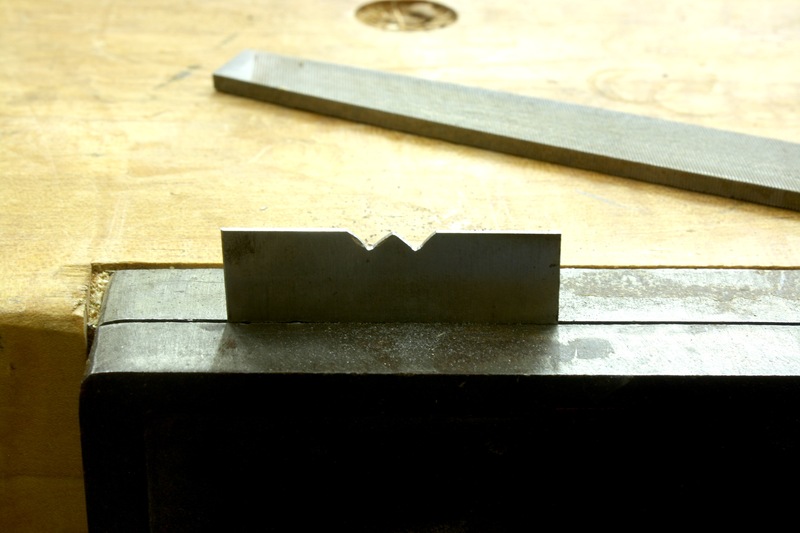 I thought the cut was a bit deep, but the bigger problem was how to rotate and align for the next cut. Because I was working on the bottom edge, it was impossible to align the bit point to any layout lines. Scrap that idea. My second power-tool effort was at my lathe. 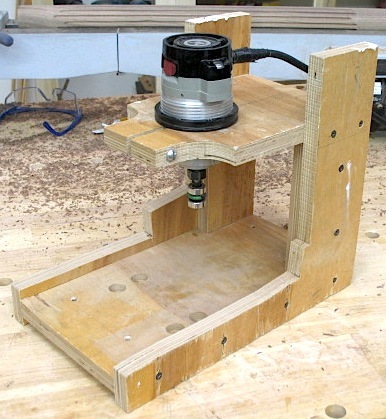 I have a jig built (shown at the right) that suspends my trim router at just the right height to allow a spinning bit to cut at the center on any turned stock. 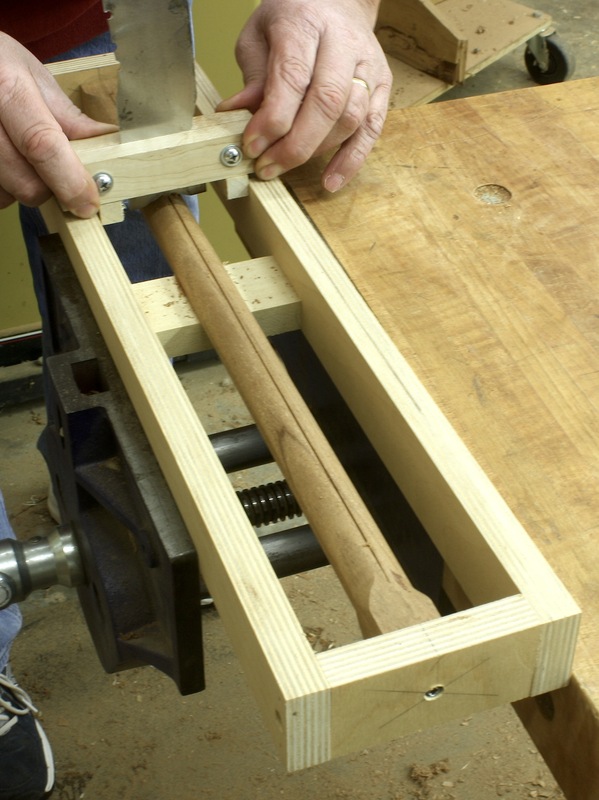 That jig setup, teamed with the indexing abilities of the lathe, suggested success. The bit I used, however, had a squared end (not a fine point) which resulted in a flat area between each reed that was unacceptable. And to use the bit consistently, I needed to run the bearings against the workpiece, and the cut was too deep, leaving the individual reeds too narrow and misshaped. The only idea I had left was to scratch the design by hand. With eight columns to profile, that’s a lot of scratching. That’s why I looked to power tools from the outset. 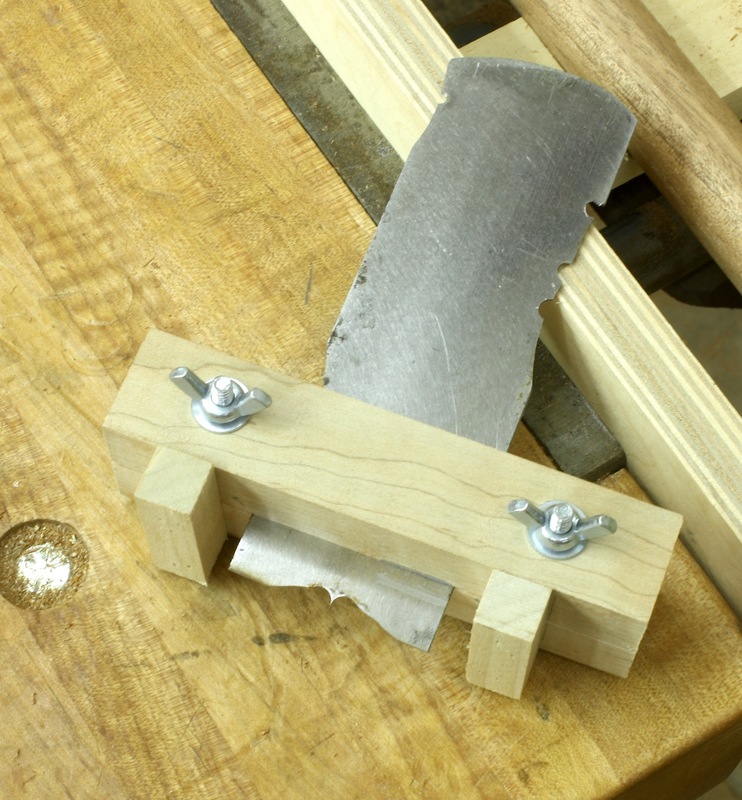 The first step was to produce the scratch profile onto a blade, which in my case was an old, previously used scraper. I found this work best completed using files. There are times when you can drill out a pattern, then touch it up. But for this design, I went straight to a file. 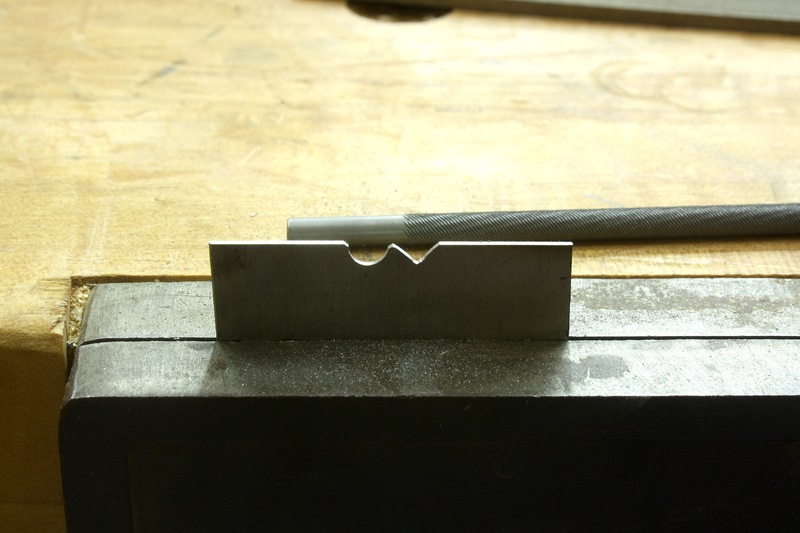 Using a square file, I cut notches into the blade to resemble a “w.” I found it easier to accurately form the notches using a square file than it was to use a round file to get straight to the radius design. As you work you make corrections to get the design just right. When I completed the design, I loaded the blade into a simple stock. I used two pieces of scrap through which I installed a couple of bolts and wing nuts. Slip the blade into position then tighten the wing nuts until the blade is secured. The carrier I built when attempting the router cut is what I used to hold the columns for scratching. To center the assembled scratch stock to the carrier, I added a couple of small blocks to the setup – #23-gauge pins did the job. I have three columns ready to go, so I’m back in the shop scratch the remaining eight. Then I have to cut and fit each column to the capitals and hood. I’ll be busy for a while.